The worst Bourne movie yet, and that includes the Jeremy Renner version, this one has got nothing new to offer. This is a really lousy movie. The worst Bourne film yet. Director Paul Greengrass and his star, Matt Damon, turned out an excellent trilogy of Bourne movies, and they should have stopped there. This time around,, the character has no personality and the story is just plain awful. It tries to copy molds of characters from previous films, as well as moments and ideas from those movies, every chance it can get. The result is just a lot of been there, done that, seen it all before feelings. There are some attempts at new storytelling, involving a social media platform, which really only comes in during the final act, and it also falls short of the mark. Once in a while there is a small hint of what this movie could have been if it pursued different avenues and had chosen smarter plot lines to follow. Unfortunately it didn’t. Jason Bourne, the fourth incarnation of the Matt Damon series, is a movie that really didn’t need to be made. From a story point of view, there was no reason to add anything further onto the original trilogy. From a financial point of view, the movie was made simply because of an interest in returning to a Bourne project by the people responsible for the series. Namely Matt Damon and director Paul Greengrass. They wanted back in, and understandably so. The trilogy that they had made together (Greengrass came on board for the second and third film,) was pretty flawless. To do it once is an accomplishment. To do it three times is pretty remarkable. And like Peter Jackson, with his Lord of the Rings trilogy, these guys made the three terrific films and then kept going. And like Jackson, (who turned to the Hobbit after ending his LOTR trilogy,) going further than three was the mistake. The result of pushing themselves and the series too far was that in order to make a fourth Bourne movie, (a fourth Matt Damon Bourne movie, not counting the Jeremy Renner version,) a ridiculous plot was cooked up. It was made out of thin air, with little connection to the original series, and was clearly designed just to give the character something to do. The action doesn’t resonate as anything new or interesting, and even worse, the characters feel like cliches of the series. At this point, Jason Bourne is practically spoofing (although it’s hardly funny,) the movies that came before it. The story is predictable at every turn, mainly because we’ve seen the very same beats and story arcs and ideas before in each of the previous films. The movie opens with Bourne on the outskirts of the world, bare knuckle fighting somewhere off the grid. It’s a fine place for use to find him in, clearly showing that he wants to remain nameless and left alone. To find him here, and know where he will end up, means the movie must find a pretty logical reason for him to be brought back into a CIA storyline. No such logical reason or explanation exists. What calls Bourne back into the limelight of the CIA is a new discovery by Nicky Parsons (Julia Styles,) who has been a CIA background employee in each of the previous films. Now she has uncovered some new files and information. So what? It’s ten years since the last Bourne film, and since Bourne had interactions with the CIA, and every door seemed to properly get closed. In the ten years since, everyone has moved on with their lives and put all of that Treadstone business behind them. Everyone, apparently, except Nicky Parsons. What she uncovers is something about Bourne’s father. 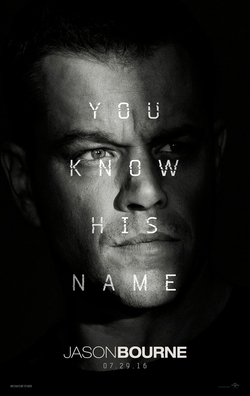 She learns that Bourne’s father was involved in the CIA program, Blackbriar or Treadstone, (what’s the difference exactly, between these two names that have been bounced around the series since it began? I guess it doesn’t really matter.) And this is what Bourne wants to know about. This is why he comes back. Bourne puts himself back on the grid and back in the headlights of the CIA because he wants to find out if his father (who has been dead for some time now,) was involved in the program or not. Maybe he could have just asked Parsons to find out for him, and send him an email when she knew. But instead, he risks everything he has worked to accomplish in ten years, just to find new answers to questions he didn’t even know existed. This is a pretty stupid plot. While the firs three films in the series were excellent, they did have one major flaw. That flaw was that, starting with the third film, a group of new villains were featured who supposedly had been there all along, from the beginning. The movie wanted to convince us of this, even though there was never a sign of these characters before, in either of the first two films. The first and second movie didn’t have this problem. They did the connection right, using Chris Cooper as the villain in the first movie and Brian Cox as the villain who carried over, into the second film. The third movie didn’t get the villains right, (it introduced three new villains played by Scott Glenn, David Stratham, and Albert Finney, all of whom were supposedly in the organization the whole time,) but at least if had the Pamela Landy character (played by Joan Allen,) carry over. With the new movie, Jason Bourne, the movie makes this mistake again, only this time, worse than ever. This time its Tommy Lee Jones as the villain, and again he has supposedly been there the entire time. His story involves flashbacks to working with Bourne’s father an creating the program. And the role is the inevitable high up, evil CIA boss that each of the other films has featured. But here, there is not connection to the other characters (whereas the third movie at least carried over Pamela Landy.) All of this could have been resolved with a flashback showing The Jones character, Robert Dewey, in a scene with Chris Cooper or with Brian Cox, or with any of the villains from the third movie. But this movie makes no attempt at effort, and that is heavily felt throughout the film. Instead, what we get is a checklist of all the usual cliches. That starts with Robert Dewey being the bigshot CIA boss after Bourne this time. He is diabolically evil in ways that this head character always seems to be (only Chris Cooper in the first movie didn’t seem to be pure evil, which is one of the reasons why it is still the best film of the series.) Next on the checklist is the assassin who is working for Dewey. It’s always a lone assassin. Each movie featured this exact same duo of characters, and the lone assassin was generally played by young, interesting, up and coming actors. Clive Owen played the assassin in the first movie. Karl Urban played him in the second one. Edgar Ramirez in the third film. And now, it’s Vincent Cassell, the Frenchman who has played more tired and lousy villain roles than anybody you can name. From Oceans Twelve to Derailed to The Brotherhood of the Wolf, this guy has made a career out of playing this exact role. For a series that used to pride itself on finding fresh faces to play this part, choosing Cassell for the role is a major downgrade. It gets worse. There is a fresh face here, of young and upcoming talent, and it is wasted. The actress is Alicia Vikander , the hot up and coming star, and she might be new to the series, but she is molded into a usual boring archetype almost instantly. She becomes the new Nicky Parsons. In fact, she becomes a combination of the Nicky Parsons and Pamela Landy character, which is to say, she’s got Bourne’s interests at heart. Whereas Dewey is the evil villain on the CIA’s side, Heather Lee (Vikander,) is the good cop in this good cop / bad cop scenario, who helps Bourne out every chance she can. What’s annoying is that the nearly the moment when Parsons is removed from the storyline, a new version of the character pops up in her place. Why does the character who helps Bourne always have to be a woman? Why is it the only women in this series are always on Bourne’s side? Even the Fast and the Furious movies break from their mold more than this series does. The story here is all about Bourne finding out the truth about his father, only apparently that’s not enough. And so there is a side story going on about how Dewey has been funding an internet entrepreneur who has created a new social media platform (called Deep Dream.) that can spy on its users. And Dewey of course wants to use this for the CIA. That storyline gets so out of the realm of realism that at one point, Dewey is trying to have two major characters assassinated at once, right on stage during a convention, because he doesn’t agree with them. This is the new avenue the movie tries to take its story in, and it doesn’t work. Neither do the old areas, which feel like recycled moments and beats from the original films. It’s not just the character molds that are on replay here, but also specific scenes. When Parsons finds herself in trouble, during an early action scene, she is hiding behind a car, taking cover from an assassin who has the car in his sights. Bourne advises her to keep still and stay there, only she doesn’t listen and panics, and it costs her big time. This is an exact moment from the third movie, in an early scene that took place at the Waterloo Train Station in London. And as if repeating it once wasn’t bad enough, this movie has the stupidity to then repeat it again. There is another scene, later in the movie, where Bourne goes to find a man who has information to give him, and the man again doesn’t listen to Bourne, panics, steps into the sight of the assassin, and meets with an unhappy result. This Jason Bourne movie doesn’t work at all. There is only one decent scene in the entire film, where the assassin (referred to as the asset here,) turns on the men who are supposedly on his side and does it in such a way that he is framining Jason Bourne for their deaths. The way all of this happens, using heat signals to monitor the assassins, as well as their deaths and lack of communication, is pretty cool. But other than that one scene, the movie just doesn’t work. It tries to recycle as much as possibly from the previous movies, including whole characters and their molds, whole storyline arcs, and even whole scenes. And then it does try to go in some new directions (The Deep Dream subplot,) and falters with those as well. There are hints of possibility here (like the mention of some backstory for why the assassin has a grudge against Bourne,) but none of it is really explored. What a shame. This movie basically makes all the wrong choices and the result is pretty much a mess.